People > Stories > Who Am I? I was born in Russia on February 16, 1904 in the village of Norka near the Volga River, 43 miles from Saratov. It was the largest city near us. My parents were Christians and they saw the handwriting on the wall. They had a desire to come to America. At that time you had to have someone in America sponsor you. We had an uncle and family already in America. They lived in Colorado and sponsored us. I was four years old at that time. I had an older sister and younger brother. My brother and I got Scarlet Fever on the way and were in quarantine for six weeks in Liverpool, England. My mother was pregnant with her fourth child and it made it hard on her as she was sick much of the time coming over. Our point of entrance was Ellis Island in the harbor of New York City. In recent years, I was privileged to go there to see Ellis Island. You could not get gain entry if you had certain diseases in the family. We passed and were on our way by train to Windsor, Colorado (this was before travel by plane). We landed right in the sugar beet country and learned hard work to begin with. If you have never worked in the sugar beets you don't understand what I'm talking about. The whole family went into the field. I started to work in the beet field when I was five years old. Mother would place a blanket on the ground at the end of the rows and place her baby on it. The she worked with the rest of the family. We went to school when we weren't needed in the field and the school year was much shorter then it is now. We walked a mile and a half to school in all kinds of weather and that was snow country. Some had to walk further than that. If you wanted to go on to high school you furnished your own transportation. We lived ten miles from town where the high school was located. We lived on a homestead of 320 acres which was given to you by the government. We had no electricity, no running water, nothing. You had to live on the place six months of the year for three years. The other six months you could go where you could make a living. You had to make certain improvements each year, like fencing the land, building some kind of house to live in. Some were sod houses. Then my parents came to Portland and life was much easier. We could find work and we had electricity and running water. I went to work at Meier & Frank when we got there. We like it so well, we stayed. I got married and we had three children. It's been a busy life and a good one too. I'm a great-grandma now, so I can sit back and enjoy the grandchildren and great-grandchildren. 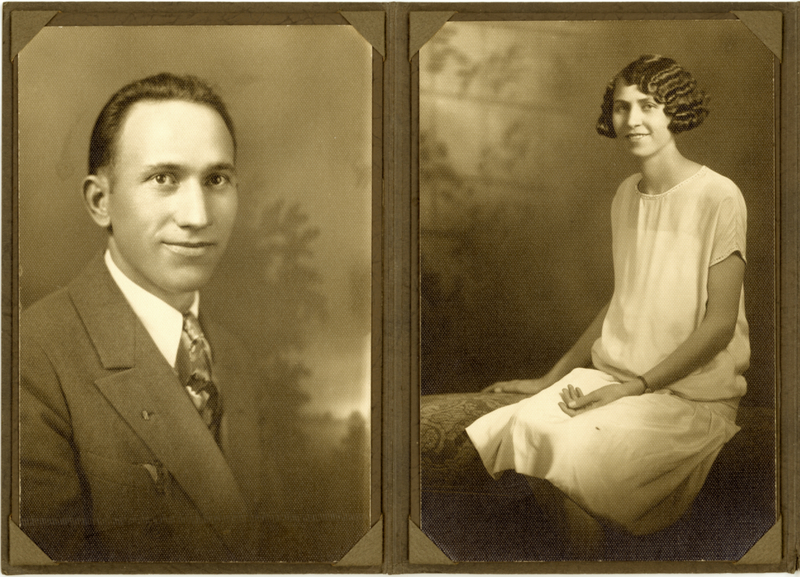 Photograph of John and Elisabeth Reiber. Courtesy of Lynn Huber and Lois Klaus. Elisabeth Klaus was born on February 16, 1904, the daughter of John Klaus (born 1880) and Anna Schlidt (born 1880). The family arrived in New York on March 28, 1908 aboard the steamship Mauritania. Elisabeth married John Reiber in 1925. John died in 1965. Elisabeth became an early member of the American Historical Society of Germans from Russia. She died on March 17, 1994 and is buried at the Rose City Cemetery in Portland. Story written by Elisabeth Reiber (née Klaus) and is part of the Lois Klaus Collection held at the Center for Volga German Studies at Concordia University in Portland, Oregon. Minor editing was done to improve clarity. Last updated December 22, 2017.